Spicy steamed broccoli with garlic, chilli flakes and lemon juice is a quick side dish to pull together any meal. When I was little I always hated broccoli. Actually, correction, I hated the idea of broccoli. It seems that at some point, all kids decide that broccoli is the most disgusting, repulsive, sickening vegetable on the planet. Luckily, I’ve matured (somewhat) since those days and now I wholeheartedly embrace broccoli in all of its greeny goodness. I would even go as far as saying that it’s one of my favourite vegetables because it is so versatile. Can I cook broccoli without a steamer? This recipe doesn’t require a steamer basket to steam the broccoli. Simply by adding the broccoli to the pan with a small amount of water, it will steam and not boil. You don’t want the broccoli to be fully submerged in the water, so using just 2/3 of a cup will be the perfect amount to also create a light sauce with the broccoli. 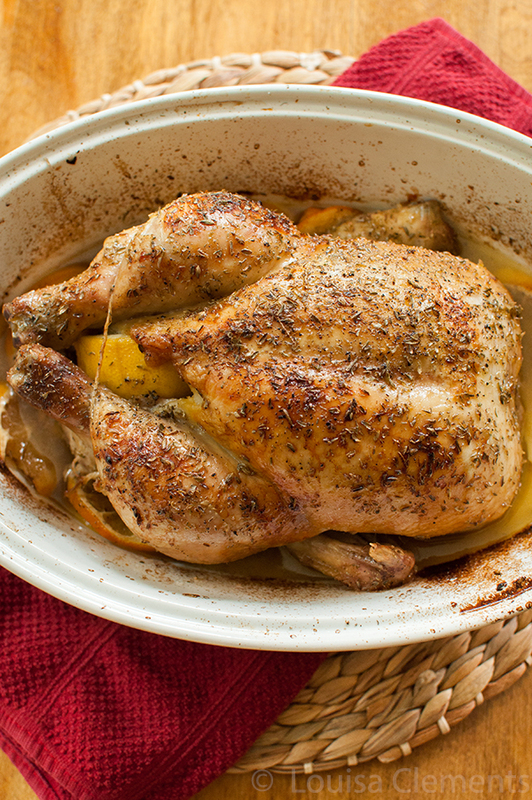 Serve this with lemon thyme roasted chicken. Steamed broccoli is a simple side dish that works with basically any main course. I typically serve it with this lemon thyme roasted chicken, but this would also go well with a roasted pork or beef dish. How do I add flavour to steamed broccoli? Steamed broccoli may seem boring but this spicy recipe leans on garlic, lemon juice and chilli flakes to add flavour while it cooks. The water mixture is then boiled down and poured over the broccoli and finished off with olive oil. Don’t skip out on the olive oil as the fat adds a velvety mouth feel and the perfect finishing touch for this spicy steamed broccoli recipe. This recipe call for 2/3 cup of water, but the amount will depend on the size of your pan. Ideally, you want about 1/4 inch of water in the pan to steam the broccoli, this recipe calls for two heads of broccoli so I would recommend using a large saute pan. 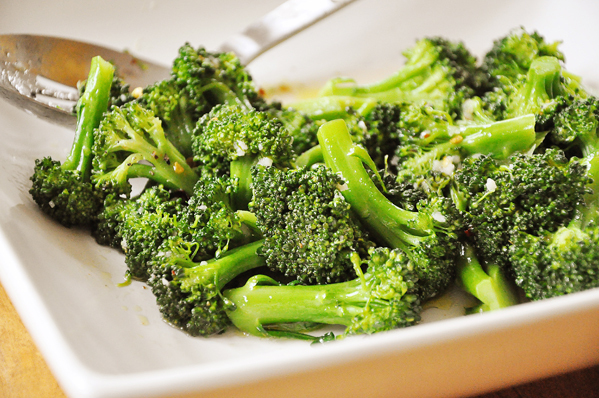 Steam broccoli in water with garlic, lemon juice, and hot chilli flakes for a quick side dish. In a large saute pan, add water, garlic, lemon juice, hot chilli flakes, salt and water to a simmer. Add broccoli to the pan, cover and cook for 4 minutes. Remove broccoli from the pan, cook down excess water for another two minutes. Remove from heat and pour over broccoli. Drizzle with olive oil and serve. Let me know if you give this spicy steamed broccoli a try in the comments below. I found your blog when searching for a carrot muffin recipe, which I will make! This looks good too. Happy, healthy days to you. I always loved broccoli even as a kid. I think if you present veggies to your kids at a very early age (before they can talk), they will grow to have less aversion to it. Anyway, this recipe looks very nice. I have some brocc in the fridge right now. I'll definitely try out this recipe. Thanks! P.S. The link to the Sunday chicken isn't working for me.